From 1901 to 1902, Gaudí built the entrance and surrounding wall for an estate owned by his friend, Hermenegild Miralles Anglès, on Sr. Güell's old private road, at what is now Passeig Manuel Girona, No. 55, in the Les Corts de Sarrià quarter of Barcelona. Mr. Miralles was a printer, binder, editor and manufacturer of pieces of cardboard imitation stone for all sorts of purposes, from toys to decorative tiles. 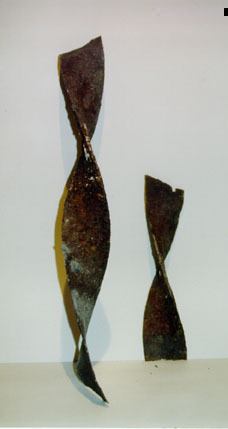 Gaudí used these decorations in some of his works--for example, in the Casa Viçens and the Bar Torino. He also used the potent hydraulic presses in Mr. Miralles' workshops to carry out pillar resistance tests. The project that was put in Gaudí's charge consisted only of building the entrance gate and surrounding wall of Finca Miralles (Miralles Estate), although some authors have also attributed to Gaudí the designs for the stately home and the typical Valencian thatched house for the garden, which were built years later by the architect Domènec Sugrañes Gras. 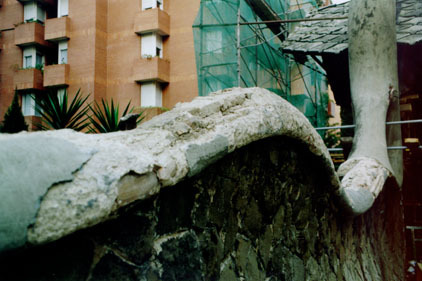 Today we can observe the great gate and only a fragment of the wall that Gaudí built. 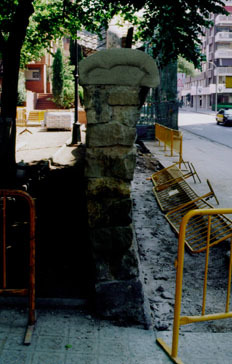 The wall was made with rubblework. Ceramic bricks and pieces of Arabic tile joined with lime mortar were used to create the sinusoidal undulation of the coping. In the restoration currently underway, only bricks and tiles, with cement mortar, are being used. One of the peculiarities of the wall is that if we view a vertical section we can observe that it is undulated. 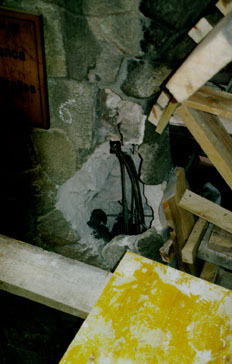 On top of the wall, there was a metallic grill that held with T-shaped rods, that were divided into three arms inside the wall to hold better. During the current restoration a new grill will also be installed. The great lobular arch (the old entrance for carriages) had a helicoidal framework inside that covered the entire perimeter, being doubled in areas that required greater reinforcement. The old framework is currently being exchanged for new stainless framework (8 mm in diameter), because the original had become corroded and had caused cracking of the covering. 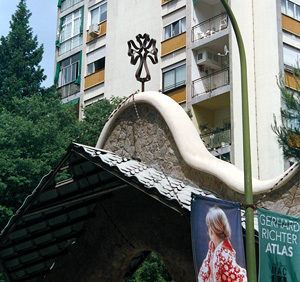 This strangely undulated arch had a canopy spreading 4.5 meters on each side, made from metallic beams built into the wall, with helicoidal ties above and below, supporting fiber-cement tiles. 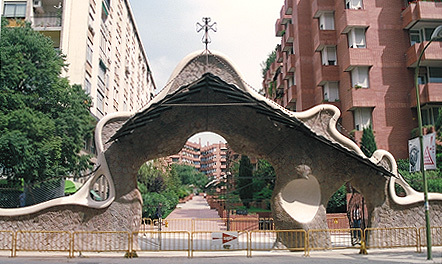 The tiles, shaped like a tortoise shell and 60x60 cm in size, are not the ones originally placed by Gaudí since the canopy was disassembled in 1965 because it exceeded the limits set by municipal ordinance. It was re-installed during the 1977 restoration, but not completely, for fear that the arch could not support all the weight. In 1902, a four-armed cross (typical in Gaudí's work) with undulating forms, made from forged iron, was placed at the peak of the large arch. There are two other copies of the cross: one in the Colònia Güell, and another in the Park Güell museum. To the right of the large arch, there is a smaller arch, where the old pedestrian gate is located. This door had been closed for years, and the lower part had been covered with dirt, causing it to be damaged. It has been repaired as part of the present restoration; the goal is to make it functional. One of the peculiarities of this door is the complicated iron work, since the iron is bent on its thinnest side. Between the two doors, there is an empty space where a cardboard imitation stone sign with the owner's name was to be placed. Because of its historical and artistic value, it has been a National Historic-Artistic Monument since 1969.